Protects carpets, fabrics and more from staining by repelling liquids! 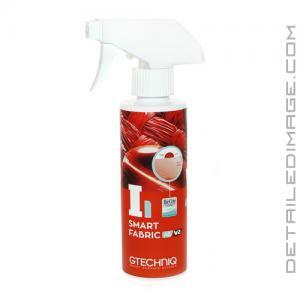 One simple spray of the Gtechniq I1 Smart Fabric AB and your interior fabrics (ie carpets, mats, etc.) will be protected from nearly anything life can throw at it! Simply spray your vehicles fabrics and the nano particles in I1 coat these individual fibers but they remain "breathable" and feel soft and flexible. That's right, no sticky or plastic feeling from this coating! Water and oil-based liquids are instantly repelled from the surface, that means coffee, wine, soda, blood, and more will simply roll off the surface! Wipe away any spills with a damp cloth and you will be left with zero staining! Apply I1 to your fabric seats, carpets, mats, shoes, clothing, and more. With the added feature of BioCote, this antimicrobial technology helps kill 99.9% of bacteria on any surface treated with it. Pick up the Gtechniq I1 Smart Fabric AB and don't let everyday accidents stain your fabrics! V2 is more durable, hydrophobic, and a has moved away from fluorocarbons to a more environmentally friendly formula than V1. I1 - Protects fabric surfaces and is highly recommended for use on convertible tops, boats and exterior fabrics. I1 AB - Protects fabric surfaces but also features BioCote, which is an antimicrobial technology that helps kill 99.9% of the bacteria on the surface. The AB properties can cause a "dust" when over applied, so avoid application on convertible tops, boats and exterior fabrics. For these areas, use the regular I1. I1 Smart Fabric AB protects all kinds of fabrics from water based stains. Gtechniq Smart Surface Science ensures treated surfaces are breathable and extremely durable. I1 makes ordinary fabrics waterproof and easy to clean. With added BioCote antimicrobial technology, treated surfaces will kill 99.9% of bacteria, and repel mould and mildew. Use I1 on any fabric from sails, tents and awnings to your car's soft top and interior. I1 is colour safe and will not change the feel of fabrics.